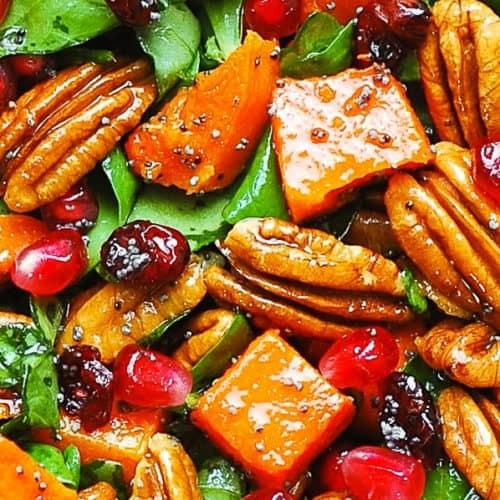 Butternut Squash and Spinach Salad with Pecans, Cranberries, Pomegranate Seeds and Poppy Seed Honey-Lime Dressing – a great choice for Thanksgiving, Christmas, New Year’s Eve or any other Fall and Winter holiday menu! This butternut squash and spinach salad is a perfect Autumn or Winter side dish, since it uses lots of seasonal ingredients that are available this time of the year. Healthy, gluten free, packed with nutrients and fiber! In a medium bowl combine 1/4 cup olive oil, 2 tablespoons freshly squeezed lime juice, 3 tablespoons of softened honey, 1 tablespoon of poppy seeds, 1 tablespoon of Dijon mustard. 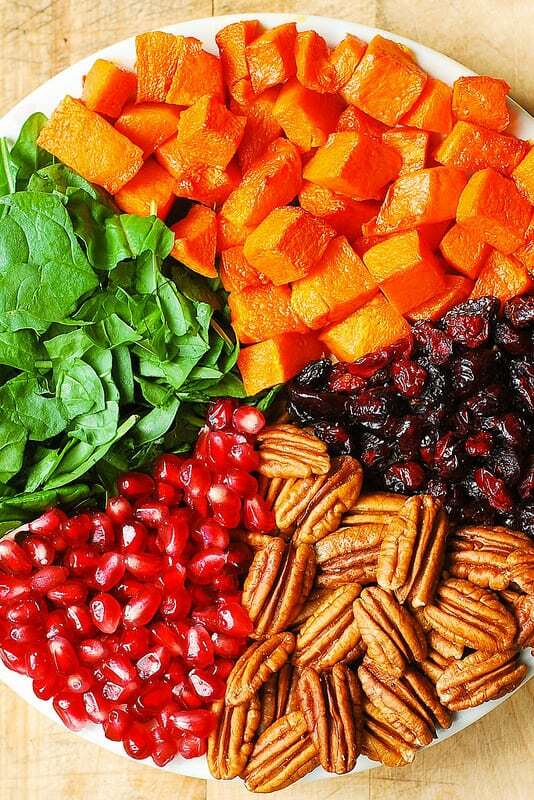 In a large bowl, combine 3 cups of roasted butternut squash (cubed), 10 oz of chopped spinach leaves, 2/3 cup of pecans, 1/2 cup cranberries, and 1/4 cup pomegranate seeds. Add the Honey Lime salad dressing and gently toss. Top with the remaining 1/3 cup pecan halves and 1/4 cup pomegranate seeds. Winter Fruit Salad with Maple Lime Dressing – the holiday ingredient list includes red apples, pears, clementine oranges (or mandarin oranges), kiwi fruit, dried cranberries, and pomegranate seeds. Honey Mustard Brussels Sprouts Salad with Cranberries and Pecans – this holiday salad is all about crisp, shredded Brussels sprouts tossed with slightly sweet honey mustard vinaigrette, dried cranberries and chopped pecans. 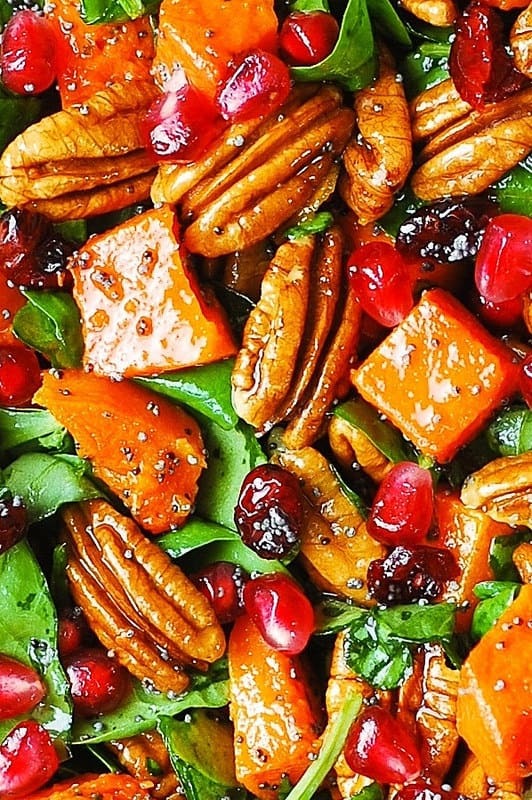 One of the best Fall salads you’ll ever make! 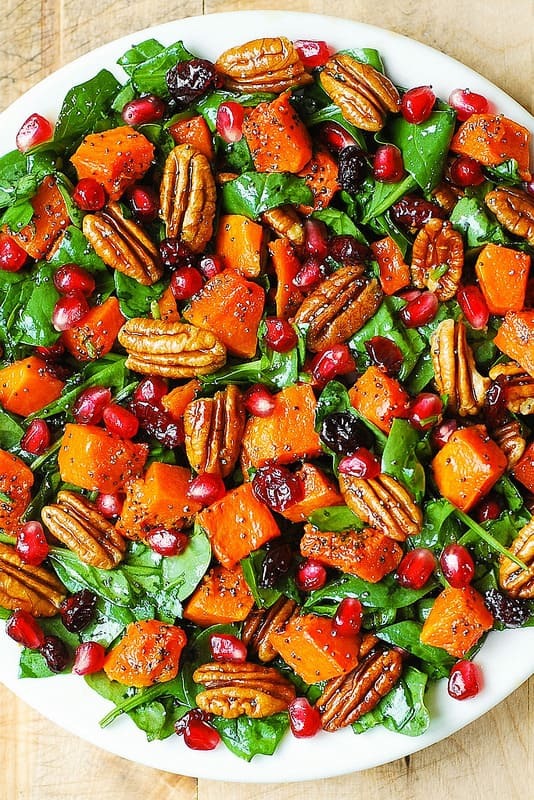 Butternut Squash and Spinach Salad with Pecans, Cranberries, Pomegranate with Poppy Seed Honey-Lime Dressing. Healthy, gluten free, packed with veggies. The best salad for Thanksgiving, Christmas, New Year's Eve or any other Fall and Winter holiday menu! In a medium bowl, combine cubed butternut squash (peeled and seeded),1 tablespoon of olive oil, a pinch of salt, and toss to mix. Place butternut squash in a single layer on the foil-lined baking sheet. Roast for 20-25 minutes, turning once half-way through baking, until softened. Combine all dressing ingredients in a medium bowl and whisk to combine. In a large bowl, combine roasted butternut squash, spinach leaves (chop them up a little), 2/3 cup of pecans, 1/2 cup cranberries, and 1/4 cup pomegranate seeds. Add the salad dressing and gently toss. Top with the remaining 1/3 cup pecans and 1/4 cup pomegranate seeds. How many serving are there in this recipe, and is it meant to served warm or cold? Looks really yummy! This recipe makes 6 servings as a side dish. It’s best to be served warm. However, I served it cold and it was delicious. People commented on this site that they served this dish cold and they loved it! Just make sure to add toasted nuts right before serving, so that they retain their texture. How far in advance can you add the dressing to the salad before serving? I’m trying to avoid wilting the spinach. I would add the dressing either right before serving or 30 minutes prior, not earlier. This is SO GOOD. I can’t even begin to explain how much I loved it. Hot or cold, it was indescribably delicious. Thank you!!!! I’ll make it many times in the future. Thank you so much, Emily! Comments like yours make my day! So glad you enjoyed the salad. Thank you so much, Joyce, for stopping by and sharing how you made this recipe! Your homemade vinaigrette sounds so delicious! Great choice for this salad! Is this meant to be a warm salad or should the butternut squash be cooled? This looks like a perfect fall salad. 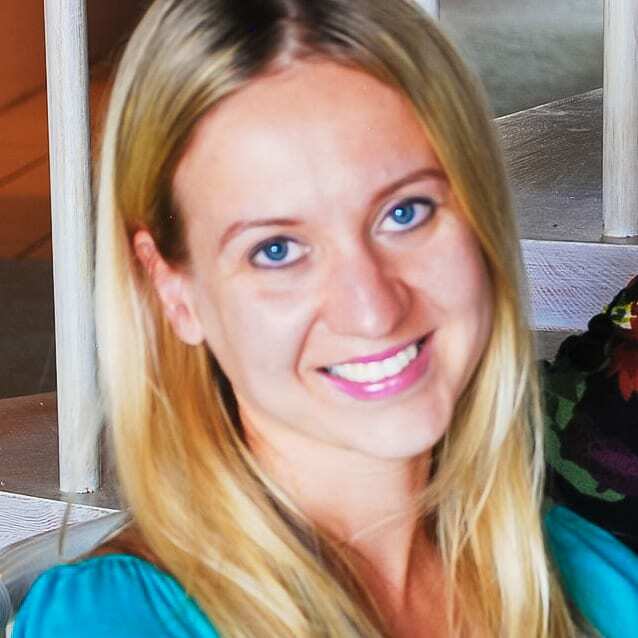 I am loving those bright, warm colors! I’m going to need to make this soon!